The Denver Broncos were struggling at 2-2, having lost two straight after opening the season with two victories, as they hosted the winless Cleveland Browns on October 19, 1975. Under Head Coach John Ralston, the Broncos were coming off the first two winning records in franchise history in 1973 and ’74, but HB Otis Armstrong, the league’s rushing leader the previous year, was sidelined with a rib injury and veteran QB Charley Johnson, a month shy of his 37th birthday, was beginning to show his age. The Browns, under first-year Head Coach Forrest Gregg, were having trouble on both sides of the ball in achieving a 0-4 record, having difficulty scoring points on offense while the defense had given up over 40 in each of the previous three contests. QB Mike Phipps had yet to live up to his first-round draft billing in 1970 and was feeling heat from backup Brian Sipe, but there was talent to throw to in WR Reggie Rucker and TE Oscar Roan, and HB Greg Pruitt, once a spot player, was proving to be valuable in carrying a heavier workload. One thing both teams had going for them was placekickers. Denver’s 34-year-old Jim Turner (pictured above), who was in his twelfth year and had originally found notoriety with the Jets, was a perfect seven-for-seven in field goal attempts thus far and Don Cockroft of the Browns, an eight-year veteran who also handled the punting, had made good on 12 straight field goal tries going back to 1974. It was a bright, clear day with 52,590 fans in attendance at Mile High Stadium. The Browns had the first possession and moved well down the field. Greg Pruitt ran four times for 23 yards and caught a pass for another 15. The drive stalled at the Denver seven and Don Cockroft kicked a 24-yard field goal. Following a short series that ended with a punt, the Broncos got the ball back at the Cleveland 25 thanks to a fumble. Charley Johnson threw to WR Haven Moses for 17 yards, but after two carries by FB Jon Keyworth advanced the ball to the Cleveland three, an illegal procedure penalty moved Denver back and they, too, settled for a field goal of 25 yards by Jim Turner. The teams traded turnovers, with CB Earlie Thomas intercepting a Mike Phipps pass for the Broncos that he returned to the Cleveland five, but HB Oliver Ross fumbled at the two to end the scoring opportunity. The Browns, with Brian Sipe now at quarterback, advanced to their 20 during the remainder of the opening period and were forced to punt. Two plays later, in the early moments of the second quarter, Johnson was stripped while attempting to lateral and DT Walter Johnson recovered for Cleveland at his 47. Helped along by a roughing-the-passer penalty in a third-and-11 situation, the Browns reached the Denver 32 and Cockroft kicked another field goal, from 49 yards, to go back in front by 6-3. The Broncos approached midfield on their next possession as Charley Johnson completed a pass to WR Bill Van Heusen for 12 yards and ran the ball himself for a 13-yard gain in a second-and-14 situation. The drive stalled at the Denver 46, but Van Heusen, back to punt, faked and threw to Ross for a gain of 30 yards, although he again fumbled and LB Dave Graf recovered for the Browns. Cleveland went three-and-out and punted, and the Broncos again moved effectively. Johnson threw to WR Jack Dolbin for a 22-yard gain that converted a third-and-20 situation and had completions to Keyworth for 16 and 13 yards to reach the Cleveland 31. The drive again was halted and Turner kicked a 48-yard field goal to knot the score at 6-6 with less than two minutes remaining in the first half. Now the Browns moved well on offense. Sipe completed passes for 10 and 13 yards to Oscar Roan that converted third downs and, with the clock down to eight seconds, Cockroft kicked a 43-yard field goal to put the visitors in front once more by 9-6 at halftime. Neither team was able to move effectively to start the third quarter until the Browns, getting good field position at the Denver 44 following a 16-yard punt return by DB Pete Athas, advanced 40 yards. Pruitt gained a yard up the middle to convert a fourth down play and he and FB Billy Pritchett carried the load before the drive halted at the four. Cockroft booted a 20-yard field goal and Cleveland was in front by six. A fumble by HB Floyd Little gave the Browns the ball at the Denver 26 and an opportunity to build upon their lead, but they came up empty when Cockroft was wide to the left on a 27-yard field goal attempt, his first miss after hitting on 16 straight. Early in the fourth quarter, another Cleveland possession concluded with Cockroft successfully kicking a 42-yard field goal, and the visitors were ahead by 15-6. WR Rick Upchurch returned the ensuing kickoff 47 yards to the Denver 43 and the Broncos proceeded to drive 57 yards in nine plays. Steve Ramsey (pictured at right) was now at quarterback, but it was Keyworth running the ball and a pass interference penalty gaining 20 yards that moved Denver along to the Cleveland 25. Following another short gain of one yard by Keyworth, Ramsey threw to the fullback for 10 yards and then to TE Riley Odoms for 13. Keyworth fittingly completed the series by plowing a yard into the end zone and, with Turner’s conversion, the Cleveland lead was cut to 15-13. The Browns got a good kickoff return of their own as WR Billy LeFear ran 38 yards to the 50 and Sipe immediately followed with a pass to Reggie Rucker for 20 yards. But after getting to the Denver ten, Cockroft nicked the right upright with a field goal attempt that bounced away unsuccessfully. Ramsey quickly passed the Broncos down the field, hitting on passes of 11 yards to Odoms and 25 to Upchurch, and Keyworth ran around end for a 34-yard gain to the Cleveland 11. But three plays later Ross fumbled once more and the Browns recovered in the end zone to blunt the threat. A short Cleveland series ended with a punt and Denver took over possession with 1:43 remaining to play. Two passes to Little and a throw to Dolbin got the ball into Cleveland territory at the 46, but two more throws were incomplete. Facing fourth-and-four, Ramsey kept the ball and ran around end for 10 yards for a first down and, on the game’s final play, Turner kicked a dramatic 53-yard field goal, which was the longest of his career. The Broncos came away winners by a final score of 16-15. Denver led in total yards (325 to 271) and first downs (18 to 17). However, the Broncos also turned the ball over six times, to two by Cleveland. 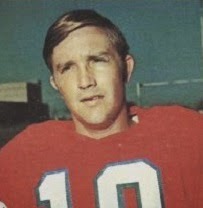 Ultimately, the game came down to Don Cockroft (pictured below), who hit on a team-record five field goals (since broken by Phil Dawson), missing two of his attempts, while Jim Turner was successful on all three of his for the Broncos, with the eight three-pointers in all tying the then-NFL record (the record moved up to nine in 1996). Charley Johnson completed 9 of 22 passes for 110 yards with one interception before he gave way to Steve Ramsey, who was successful on 10 of 12 throws for 94 yards with no TDs or interceptions. Jon Keyworth ran for 62 yards on 11 carries that included the game’s only touchdown and caught 6 passes for 45 yards. Rick Upchurch averaged 32.8 yards on six kickoff returns to go along with 21 yards on two catches and seven yards on one running play. 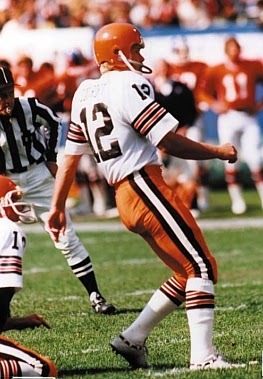 For the Browns, Mike Phipps was two-of-eight for 28 yards and gave up an interception and Brian Sipe was 12-of-25 for 111 yards and had none picked off. Greg Pruitt gained 64 yards on 19 carries in addition to catching three passes for 20 yards. Oscar Roan was the top receiver with 5 receptions for 52 yards. The stirring win for the Broncos, which nevertheless highlighted their problems on offense, was followed by three straight losses as they went on to a disappointing 6-8 record, which placed them second in the AFC West. Cleveland reached 0-9 before winning three of its last five games to finish with a 3-11 tally that ranked at the bottom of the highly-competitive AFC Central. Jim Turner went on to achieve a career high for field goal percentage at 75.0 (21 of 28) and, adding in 23 PATs, he scored 86 points. 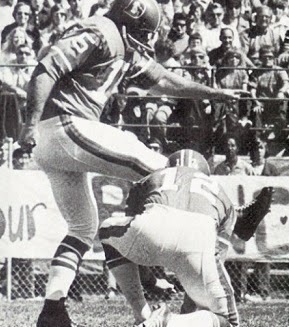 Don Cockroft finished 17-for-23 in field goal kicking (73.9 %) and also averaged 40.5 yards on his 82 punts.